Rudolf Schlichter was born in Calw to a family of six children. He worked as an apprentice in an enamel factory from the ages of sixteen to nineteen. He left this job to attend the School of Applied Arts in Stuttgart and then the Karlsruhe Academy, where he became a master student. In 1916, he was recruited for military service, but was released from duty after protesting the war with a hunger strike. Schlichter’s political and artistic activity continued after the war; in 1919, he became part of the Novembergruppe, met the Berlin Dadaists--including George Grosz and John Heartfield--and joined the German Communist Party (KPD). From 1921-23, he was supported by Edvard Munch. 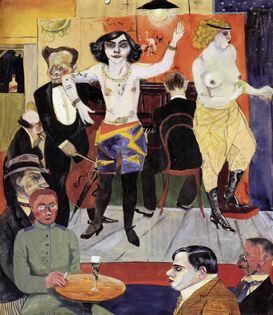 During the later Weimar years, Schlichter exhibited at several Berlin galleries and published many illustrations. He was included in the Neue Sachlichkeit exhibition in Mannheim in 1925, and had a solo exhibition at Galerie Neumann-Nierendorf in 1928. In 1937, with the rise of National Socialism, Schlichter suffered the same upheaval as many of his fellow artists: he was expelled from the National Union of Visual Artists, and his work was confiscated from museums. The following year, he was arrested for slander and “un-National Socialist conduct,” but he had the good fortune of being released after only three months. He soon thereafter moved to Munich, where he lived out the war untouched. In the 1950s, he exhibited several times in Munich, Berlin, Stuttgart and Kaiserslautern. He died in Munich.